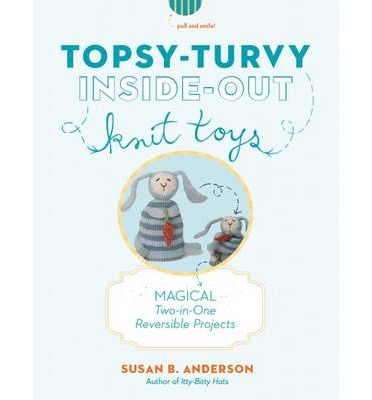 Just when you thought she couldn’t get any more adorable, Susan B. Anderson has topped herself with her new book, Topsy Turvy Inside Out Knit Toys. I was a huge fan of her Itty Bitty series, poring over every single design in Itty Bitty Hats not just for gifts, but for the sheer charm and inspiration of each tiny hat. I still think of the Upside Down Daisy hat when I want to give myself a little lift. Imagine my delight when I learned that Susie lives in my town, Madison, Wisconsin! She let me interview her for one of the very earliest issues of Knitcircus (in print, no less), and I found her as warm and generous as everyone who reads her blog knows her to be. Susie and I meet up as often as we can, to enjoy some tea, her homemade banana bread and knitting together. She’s always the perfect hostess, offering warm beverages and home-baked treats in her clean, beautiful home with a genuine humbleness as if it’s no big deal. Something I admire tremendously in Susie is her commitment to her family and ability to put her four children first firmly and graciously at every turn, while still maintaining a successful career as a designer. Susie always offers great advice and encouragement , and knits faster than almost anyone else I’ve met! She is genuinely excited about knitting and loves to showcase other people’s designs, yarns and handmade treasures on her blog, making a positive splash in the knitting community on their behalf. As you may know from the podcast, I’m a knitted toy enthusiast, and Susie’s new book explores the most fascinating knitted toy realm, reversible toys. It’s two toys in one! I still remember my friend in third grade who had a Red Riding Hood doll whose skirt could reverse to reveal the wolf in Grandma’s clothes. Susie’s designs have no scary wolf lurking inside, only the promise of hedgehogs, bunnies, fairies and baby penguins to delight even the smallest kids. But my 11-year-old girl wants the Hedgehog/Squirrel, too! Inspired by the sweet animated book trailer, here’s a progress of my own knitted Happy Mouse/Sad Mouse, the little round-bellied flip toy from Topsy Turvy Inside Out Knit Toys. I used one of my gradients to shade the mouse from light to dark. You, too, can knit an adorable flip or reversible toy from Susie’s new book; to win a copy, please leave a comment telling us which cutie from the book you would knit first. The giveaway runs through September 8th, and the winner will be announced on the 9th, the day before the next blog tour stop, September 10th with the incomparable Wendy Bernard, of Knit and Tonic! It would have to be the dog and dog house for me. I’m a sucker for egg to penguin! They’re all adorable but I really like the alligator and the egg. I need to knit the snowman/christmas tree for my sister. She collects snowmen. I would start with egg to penguin. It has to be this adorable dog to the doghouse…. Can’t get over how cute they all are in the book!It has to be this adorable dog to the doghouse…. Can’t get over how cute they all are in the book! I would definitely do the Dog/Doghouse combo. Thanks for the lovely review and giveaway. As a listener of your podcast and a reader of your blog and Susan’s, I can tell you have a special friendship with one another. It truly shows in your review. The snowman and tree for sure! I torn between the snowman/tree and the Petticoat Dolls. Thanks so much for the giveaway! Susan’s toy patterns are the best! The hedgehog/squirrel is my favorite! The penguin! I’ve been admiring this book! It looks wonderful! I would make the snowman/Christmas tree. I’m doing a Christmas swap on Ravelry and it has gotten me in the spirit already. I think the egg to penguin is adorable. I will really enjoy knitting her. I think all of the projects are so adorable, but I would start out with the dog/doghouse. I would start with either the Dog in the doghouse of the Snowman and Tree. This is such a clever book. I would like to make the alligator/egg first. Thanks for the chance to win this book. I think I’d knit the Snowman and Tree, since the holidays are right around the corner. So cute. With the holidays coming on (eek! ), it would have to be the snowman/tree for me. There are littles in my life who I think would love these as gifts. The one I want to make most is the doll who reminds me of a toy I had when I was a kid – I loved that toy like crazy. Our son and his wife spent two austral summers working in Antarctica, so the egg to penguin would be such a fun little surprise for them. I love the Petticoat Dolls and thanks for the giveaway! Hedgehog and squirrel is adorable. I would knit Pigs in a Blanket first. I had one of those reversible dolls, too, that my grandparents brought from their vacation to Jamaica. It’s the egg/alligator for me! I have two favorites..egg to penguin and the snowman tree. I have lots of little grandchildren who would love these patterns. So adorable! This book has been on my wishlist ever since I heard about it — I really hope to win! I’ve knit several of Susan’s designs before — a hat, and both Ribbit and Rabbit. My daughter especially loves Rabbit. I also have the Spud And Chloe At The Farm Book, with enough yarn in my stash to knit up several of the pieces from the book — they just haven’t made it to my needles yet. If I won this book, I’m pretty sure that the first toy I’d knit up is Bunny & Lamb. They look adorable, and I’m sure my daughter would love them! I would knit the little penguin. I think he would be so fun to give as a Christmas gift. I would start with the penguin/egg, but really excited about the petticoat girls. I love the mouse and hedgehog. Really they are all so cute and I have 8 grand-kids that would love each one. I have made the hedge hog & squirrel I think the pattern had been in an old Knit Simple magazine. I love the way Susan writes her patterns there is no question as you knit with her simple and direct style guiding you. I have tried my hand at writing a few patterns and no that this is no easy task. I would love to win a book because toy knitting is one of my favortie things. The bunny and lamb is what I would knit first…thanks for the offer of possibly getting this book! I’d make egg to penguin first. I really love the egg to penguin. My 3.5 year old would really love making these toys work. Thank you for the chance to win! I would want to make the petticoat dolls first! With the holidays ahead, Susan’s book is perfect to find a unique knitted gift for anyone on our list. Children, teenagers, co-workers, even grandparents would enjoy experiencing the transformation that is created. Who doesn’t love FUN? I would begin with the egg that hatches either the penguin or alligator. I love how each creation can be easily personalized. I want to make all of them because they are so irresistible, but I’d probably begin with the dog and the doghouse or the petticoat dolls. Thanks so much for your generous offer. Hmm, perhaps the bunny/lamb or squirrel/hedgehog! One son is obsessed with bunnies and both kids love to watch the squirrels as we walk to school. But all of the designs are absolutey adorable! I’d have to start with the dolls. I have a daughter and two nieces that are 4 years old. Dolls are a pretty hot topic as you might imagine. I’d start with snowman/Christmas tree. Snowmen are so happy looking. I would knit the rabbit with carrot first because I love stripes and floppy ears. I’ve loved the idea of inside out toys since I bought the Itty Bitty toys book. There are so many I would like to make, including the Petticoat dolls, Squirrel/Hedgehog, Fairy/Flower. There are a number of youngsters in the family who would love such toys. The little alligator for my great grandson and the butterfly for my grown daughter. This is my Birthday weekend so that would be the best present. They make me smile and I love making toys as have for years for all my family……just a big kid at heart. Oh, my other daughter is bunny happy and yet another daughter adores penquins. Squirrel / hedgehog. So cute! I’d love to knit the egg to alligator for my grandsons – I know they’d love it! I think that the alligator to egg would be fun! so hard to decide – but I guess the alligator – I have a 5y.o. grandson and he would absolutely love it! thanks a bunch! Oh, I would knit the fairy! So cute! Egg to penguin! I love the penguin’s awkward little wings. It would have to be the Bunny-Lamb, followed closely by the Snowman- Tree. The grandsons would like the Dog-Doghouse. I like them all! Tree to Snowman – tis the season! I would knit the Top-Down Seamless Petticoat Doll. One for each of my four daughters. I’d start with the Egg to Penguin toy. So cute! The doll/doll!! All are adorable, though! I love all of them and I would like to knit all of them for my 8 grand children. Woof! The dog house to dog for me! Either the doll or the snowman/Christmas tree! Bunny to lamb and squirrel to hedgehog for me! The dog and doghouse for me. They are all so cute but I l’d like to try the snowman and the tree. The chrysalis to butterfly is fascinating–I love its naturalness! That would be the first one I’d knit. I would do the flower fairy first. I know a little girl who would love it! I’m a big fan of Susan’s patterns and would love to have this book. It’s hard to decide which I’d knit first, but I think the petticoat dolls or the dog/doghouse. Thanks for the opportunity! I would knit the little penguin first–he’s so cute, and my daughters love penguins. I truly think the dog/doghouse is the BEST! It’s so cute but everything in the book is so cute, too! My daughter showed me her book and told me about this website. I hope I win and get this book for my birthday. Dog to Doghouse would be my first choice to knit! I would be tempted to knit the Chrysalis to Monarch inside-out toy first. I have knit so many of Susan’s patterns, including two of her inside-out toys which I love. 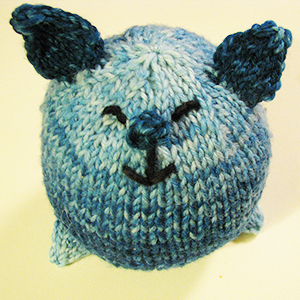 I knitted the egg to blue bird from Itty Bitty Toys and two of the chick to bunny toys for my children from her blog. In fact, I just remember that I knitted three of the egg to blue bird toys and give two away to expectant mothers and kept one for myself. Love Susan B’s patterns! I’d choose the egg/penguin first. They are all cute but I think I’d go with the pigs in a blanket. No doubt about it, I’d knit the Hedge Hog to Squirrel. Thanks for the giveaway. hummm, I’ve bought all Susan’s previous books because I just had to have them, so it would nice to win one. My first project would be the dog-doghouse. with the holidays and winter approaching I do believe that I would make the snowman/christmas tree for gifts. Thanks for the give away. How fun! Andi now have little ones in the family to knit for! Love the doll! Since Christmas is just around the corner, I would make the snowman/tree. He is so cute! I would do the snowman to tree first. First would be Chrysalis to Monarch…but it wouldn’t be the last!!! Dog in the doghouse or pigs in a blanket. My 21 month old little sister would love either! I want to knit the dog to dog house first! It’s so hard to choose, but it would have to be the hedgehog/squirrel! Oh I would knit lots of the snowmen to Christmas trees as gifts for all the littles in our family!!! Beautiful book! I would do the egg to penguin first, it would be a gift for the 5 year old I get to spend my days with. He is the youngest of 4 boys, so, even though I would love to knit the girly petticoat dolls, I would have to stick with the other patterns for the boys first. My girls are in college, so I don’t know if they would like the dolls-but wouldn’t they be cute if I knit them in their college colors!?? I think I would like to make the egg to penguin first and then work up to the dolls.